Minerals, including various metals and salts, constitute an important part of our diet. Together with vitamins, they serve as "keys" which activate the biochemical processes required for normal functioning. Our bodies require minerals to build bones, manufacture blood cells, balance the fluid composition of the body and the blood pressure and keep the nervous system functioning normally, and for many other roles and processes. Magnesium is a structural component in the bones of our skeletons; along with calcium and phosphorus, it is one of the most important minerals in the bones. Bone mass contains more than half the magnesium content of the human body, and magnesium plays a decisive role in protecting our bones and keeping them healthy. Among its roles is the activation of alkaline phosphatase (an enzyme which mineralizes calcium in the bones). Women who suffer from a low bone mass have a magnesium deficiency, not a calcium deficiency. In fact, it has been found that giving magnesium to women receiving hormone therapy raises their bone mass levels by 11% (J of Nut Med 1991). Furthermore, magnesium has been found to be of importance in balancing the hormones PTH and calcitonin. It is generally considered that the ratio between calcium and magnesium should be 2 units of calcium per unit of magnesium. Magnesium is to be found in the red blood cells, muscles, soft tissues and nerve cell fluid. It helps the body keep a normal pH level (7.35-7.45) in the extracellular fluid. In addition, its antacid properties help to balance the basic levels of various substances in the body. Magnesium is involved in approximately 300 enzymatic processes in the body. Accordingly, abnormal magnesium levels in the blood may cause a variety of problems, such as irritability and a tendency to anger, restlessness, fast resting pulse, muscle tremor, hypertension, confusion, disorders of the carbohydrate metabolism, and difficulty in building the DNA and RNA protein structure (together with vitamin B6, which is required for all protein building and decomposition). Keeps the heart healthy and helps to balance blood pressure. Magnesium deficiency causes a wide variety of clinical signs. Muscles: weakness, spasms, lack of muscle control, rolling eyes, eyelid tremor. Central nervous system: apathy, irritability, confusion, anger. Heart muscle: fast resting heartbeat, hypertension, fibrillation, multiple sclerosis and sudden death. Magnesium deficiency can also cause sensitivity to digitalis and hypocalcemia. There is a surprising correlation between heart disease and magnesium deficiency, especially in men. Intracellular: metabolic disorders, difficulty in composition of nucleic acids. The following are among the main reasons for low levels of magnesium in the bloodstream: too much protein in the diet, too much vitamin D in the diet, too much calcium taken as a food supplement, too much fat in the diet, taking oral contraceptives. The following factors improve magnesium absorption: vitamins such as B6, C, D (at doses lower than 400 IU per day), calcium (up to 1200 mg per day), phosphorus (up to 1200 mg per day), a balanced diet with all food groups, adjusted for physical activity. Tests of magnesium levels in the bloodstream are not considered to provide valuable information on the intracellular magnesium levels. As of today, there is no reasonable test which can determine intracellular magnesium levels. One of the problems in the administration of minerals in general and magnesium in particular is the form of mineral bonding. Without proper bonding (generally organic), most minerals are absorbed at rates equal to only a few percent of the dosage actually administered. Bonding magnesium to citric acid - citrate - has been shown to be the most effective form with the least amount of side effects. This form of magnesium is especially effective in preventing the formation of kidney stones. Magnesium citrate is perfectly absorbed and is especially suitable for people over 40, because mineral absorption decreases with age, due to the decrease in stomach acid production. Vitamin B6 is essential to the metabolism of amino acids, fats and nucleic acids. It affects cell division and growth and is therefore important to the proper functioning of the immune system, mucosa, skin and blood cells. Furthermore, it plays a vital role in preventing anemia. It is essential to the proper activity of the brain and in preventing depression and loss of appetite. It helps to eliminate fluids from the body, prevents edema and kidney stones, relieves nausea in pregnancy and premenstrual syndrome (PMS), and helps to prevent skin blotches and sensitivity to sunlight. 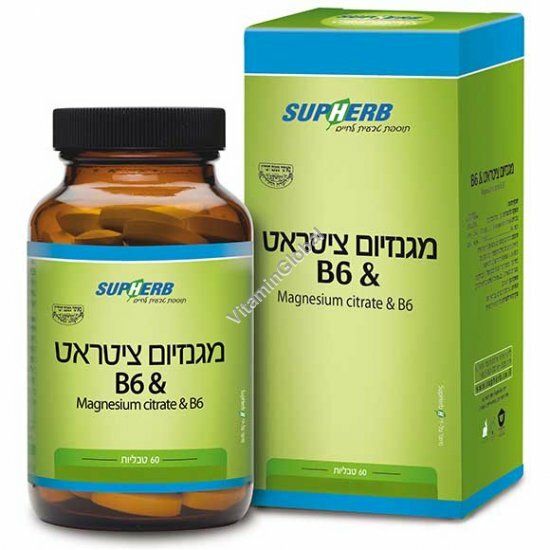 Vitamin B6 is known to improve the assimilation and activity of magnesium in the body. Directions: Two tablets per day, after a meal.